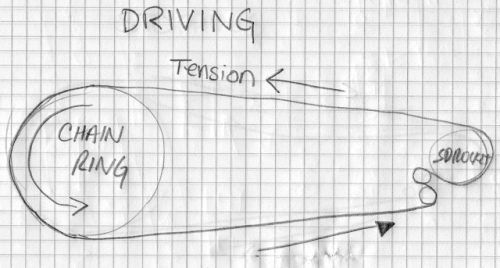 In order for regenerative braking, we need to have a fixed gear system where a clutch engages or disengages the motor from spinning with the rear wheel. In order for the rear wheel to transfer its torque back to the motor, the wheel must be equipped with a fixed gear mechanism. Much like a fixed gear bike, this eliminates the possibility of having a derailleur system on the drive chain. In order to understand why the bike cannot have a derailleur, we will consider a simple bicycle. 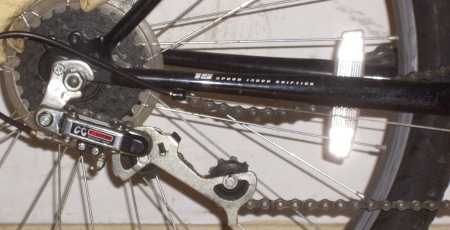 During pedaling, tension on the chain would be created at the top of the chain and directed toward the pedals, thus spinning the wheel, as in the picture below. 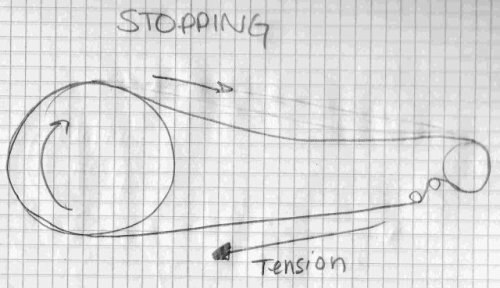 During stopping, the rider resists the motion of the pedals, applying pressure in the opposite direction. As a result, the tension is now in the bottom of the chain, directed again to the pedals. As a result, if a rear derailleur, or any other pully-type chain tensioner, will fail. 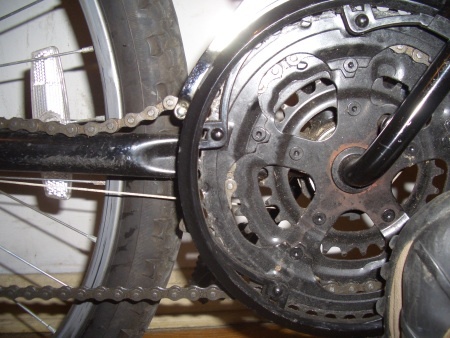 The derailleur will be pulled forward by the tension in the chain, possible causing damage to the derailleur, but undoubtedly eliminating its ability to maintain tension on the chain, and causing the chain the switch to the smallest sprocket, due to the extending of the derailleur. In taking these photographs, simulating the braking tension actually caused my chain to become wedged between the smallest sprocket and the rear fork of the bike. 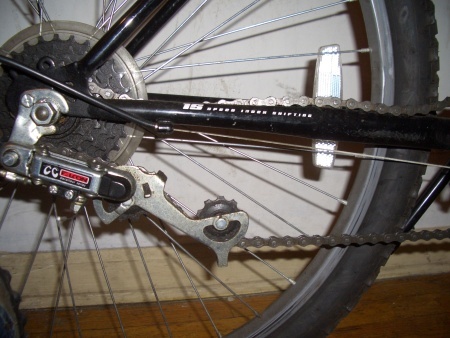 Below is a photo of the standard position of the derailleur. 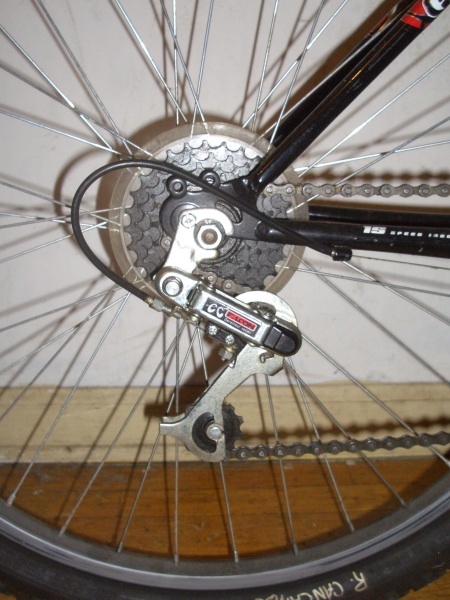 The photographs below show what happens to the derailleur during braking. Notice the extreme slack in the chain on the top. If i had actually been riding the bike, the chain surely would have caught on something (likely my front derailleur) and caused severe damage to me and the bike. Consider also the front derailleur. Suppose you wanted to build a system without a rear derailleur, but has multiple chain rings and a front derailleur. 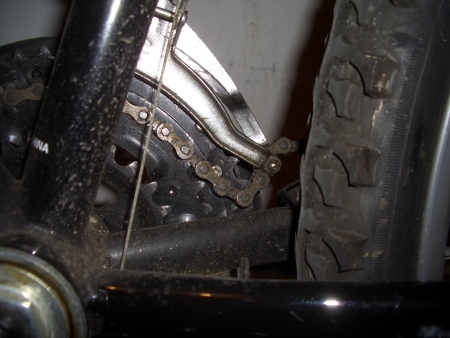 You will still have the problem of chain slack when driving in anything but the highest sprocket and would need to devise a method of maintaining tension. Consider also what would occur if the derailleur were operated during braking. The typically bike derailleur requires that the bike be pedaled forward to change gears. This maintains tension at the top of the sprocket (where the derailleur is) and allows the shift of gears to occur. If the derailler were operated when power was not being transferred from the pedals to the rear wheel (i.e. whenever proper tension did not exist), the effect would be immediate an devastating. 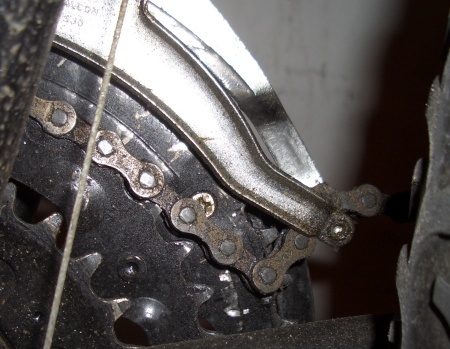 Since the tension to move the chain to a different sprocket does not exist, the friction against the derailleur and sprockets will jam the chain. In a fixed wheel system, this will either cause the rear wheel to lock, and/or damage to the drive train, especially the derailleur.